Here’s an update on the painting. I’ve gotten her face and hair, and the window painted. I need to darken the back wall, but I’ll wait until I get the rest painted in first. 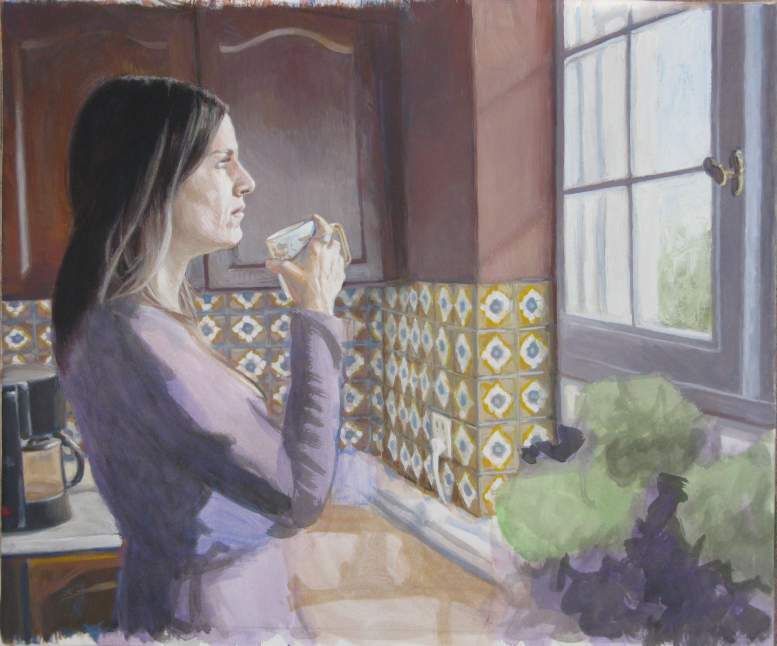 I continue to be wrapped up in a family crisis, so I haven’t yet gotten back to my painting, but hope to tomorrow. In the meantime, I made up some more casein paint yesterday. This time I made some yellow ochre. It came out very good. The paper shows a thin wash, and an undiluted sample painted over a black sharpie ink marker. I decided to use my last empty 45ml tube instead of the new 37s I got recently. All this paint I’ve been making has got me wondering if anyone would be interested in buying some tubes of paint from me. 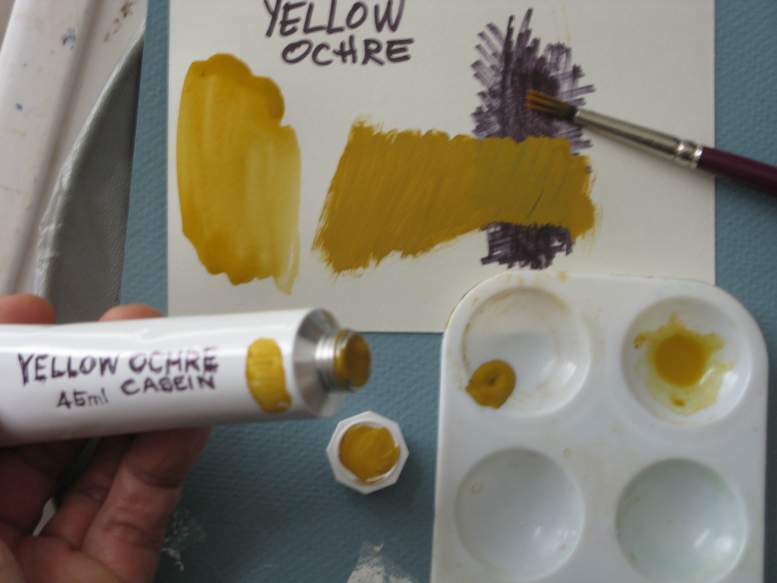 Right now I have a bunch of burnt umber, titanium white, red oxide, and this yellow ochre. I have a few small jars of other colors, but can easily get more. I could put together a “basic set” of six tubes, such as what Richeson does with their caseins. I’m sure I could affordably sell it for $15 to $20, and possibly individual tubes as well for $3 or $4. That would be much cheaper then Richeson. Not sure how I would market them. Perhaps an Etsy page, or a Go Fund Me project would work. Does this sound like something any of you would be interested in? If so, please leave me some feedback. I’ve been preoccupied lately with a family matter, and will remain so for awhile, so progress on this will be slow, but I’ll try to squeeze in time as I can. Not a too much new on this update to show, just the tiles on the back wall have been added. One thing I wanted to mention about working in casein that I can use this as and example regards later varnishing procedures. After a various length of time, casein paint will cure to a point that it can be varnished by first adding a protection isolation coat. For that I use an acrylic medium from Liquitex called Gloss Medium and Varnish. 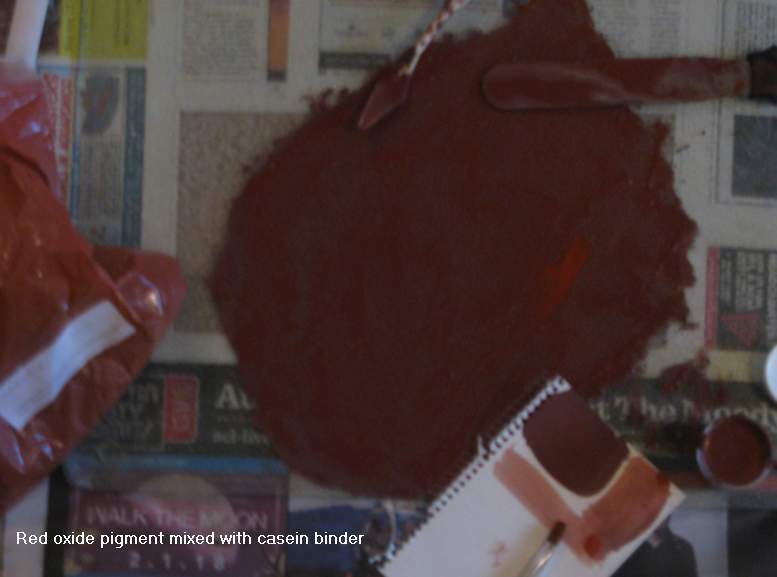 Before I apply that, I like to test the casein paint surface to make sure the acrylic medium won’t disturb the paint. In this painting there are scrap areas above and below on the paper surface that will be trimmed off. I can use the paint on that area to test the acrylic. If such a space isn’t available, I can just paint a separate scrap piece of paper when I finish the painting, or paint on the back. That way the paint sample will cure for the same amount of time. If the casein is not disturbed I can safely apply the acrylic isolation coat, and once that dries I can continue to apply two coats of an acrylic-safe varnish. 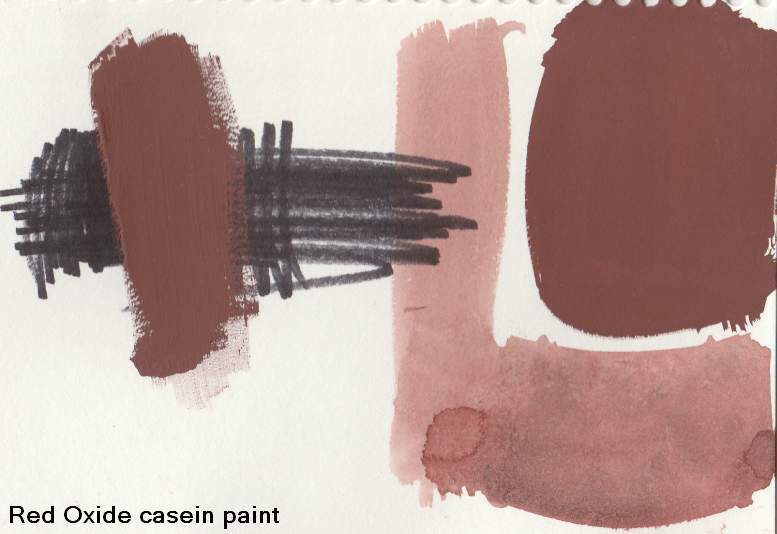 I find that 3 to 4 months is the average amount of time to wait for casein to properly cure, but it may take less time depending on the thickness of the paint. 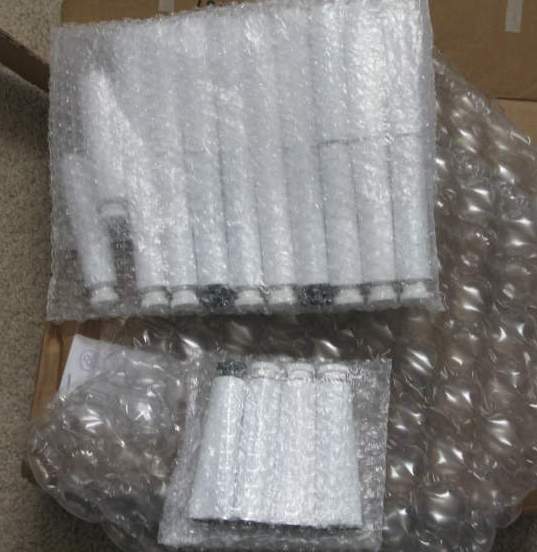 The empty paint tubes I ordered arrived on Saturday. I got 24 37ml tubes for $20 including shipping from Cheap Joe’s. I used one of them to hold the red oxide paint I made a few days ago. I’ll need to make up some yellow ochre soon, I think. I’ve gotten a little further on the painting. 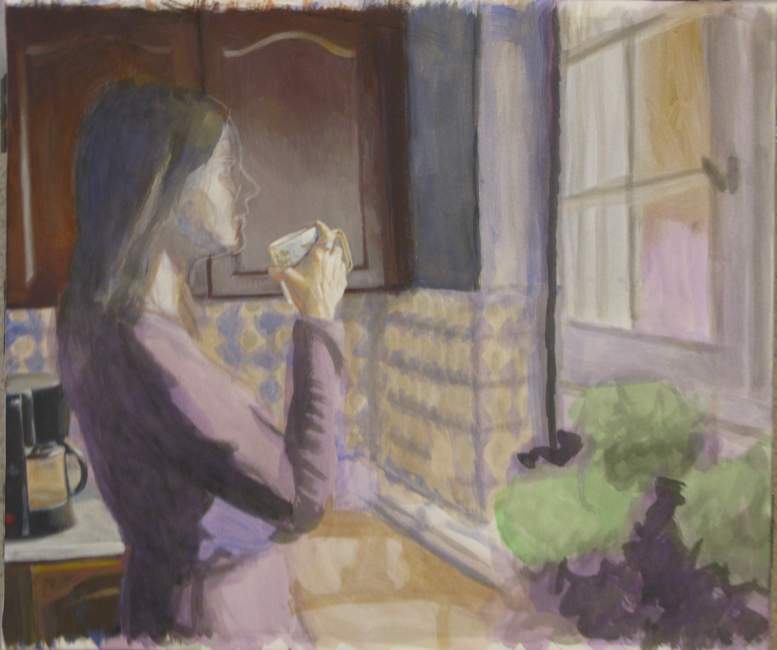 Added some neutral undertone washes, and started working on the cabinets, hand and cup. 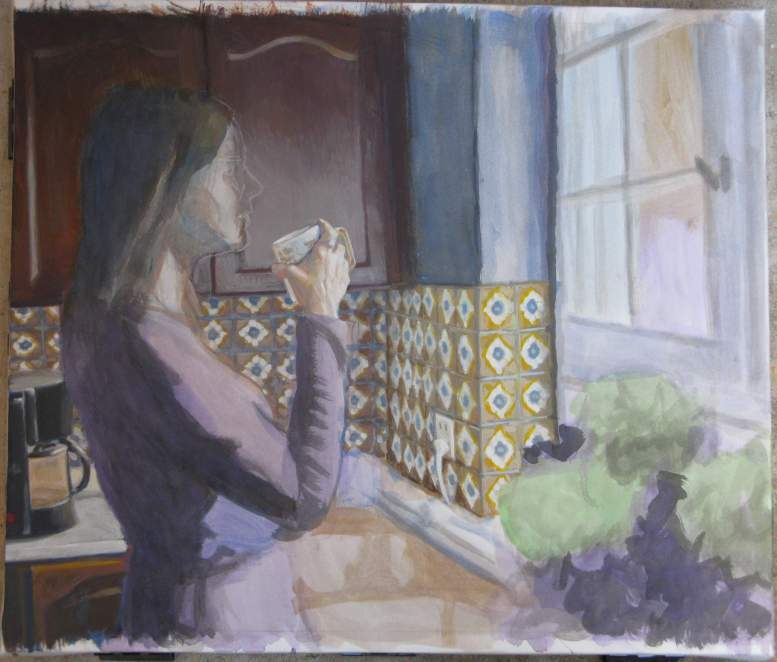 I had forgotten to put in the coffee maker in the layout, so I painted that in, too. It’s all still rough. I’ll polish it up as I get further along. As I’m starting to work on the background of the new painting, I noticed I was too low on the red oxide paint that I wanted to use, so I needed to mix up some more. 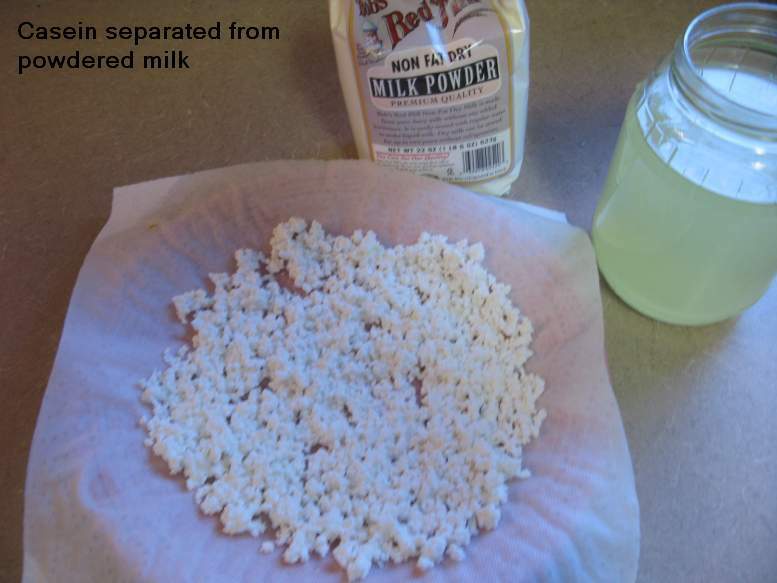 I also wanted to test out the package of Bob’s Red Mill milk powder I bought recently to see how well it works for making a casein binder. 1 quart of rehydrated milk gave me a little less than 6 ounces of casein when I added 1/2 cup of vinegar. That’s the separated milk liquid on the right. I’m used to seeing the milk coagulate into a large ball after I add the vinegar, which I then tear it into small pieces so it will dissolve better. This milk forms small clumps of casein instead, as seen here, so that saves me an extra step. 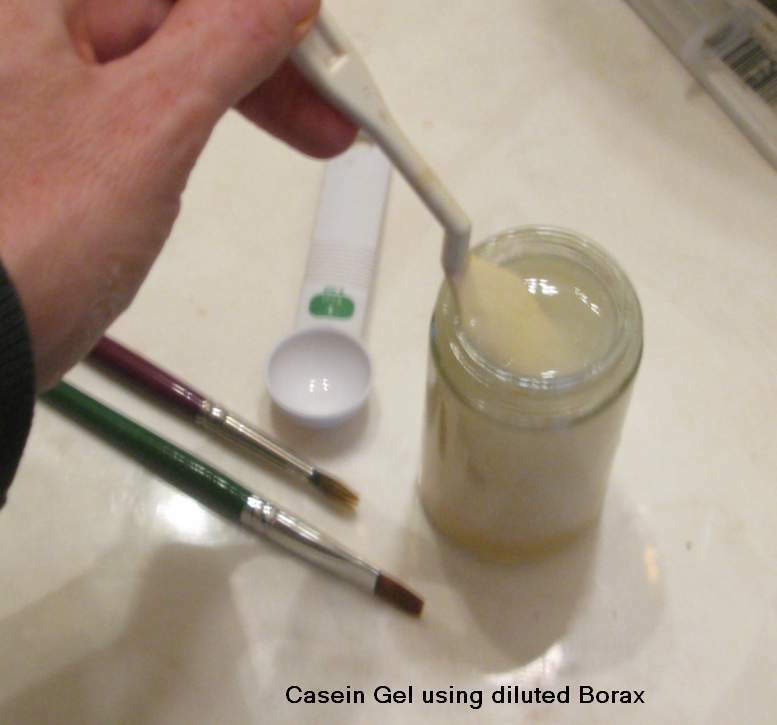 I added about 2 teaspoons of Borax diluted in 1/2 cup distilled water to this casein, and let that sit for about 24 hours to form a thick smooth gel. This will be my paint binder. 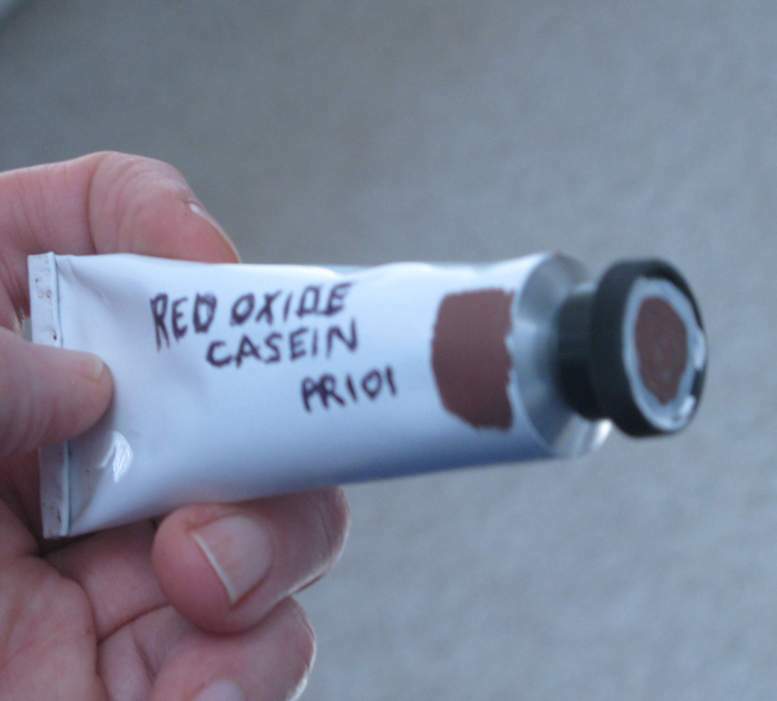 The red oxide pigment was purchased from Camden Grey. A one pound bag cost me only $3. It makes a lovely dark red burgundy color that mixes very easily with my binder. I’m waiting on an order of empty paint tubes to arrive, so I’m using a one ounce jar in the meantime. Here’s a scan of the paint on a piece of watercolor paper. I painted it over some black Sharpie marks to show how opaque it is. It also thins down nicely. Now I’m ready to get back to work. Okay, all the holiday trips and parties are over with, and I’ve caught up on the postponed chores, so now I can finally get back to that painting I was developing. This is a sheet of heavy-weight watercolor paper (16 x 20″) that I’ve stretched to a wood frame. I showed in an earlier post how this frame was put together. 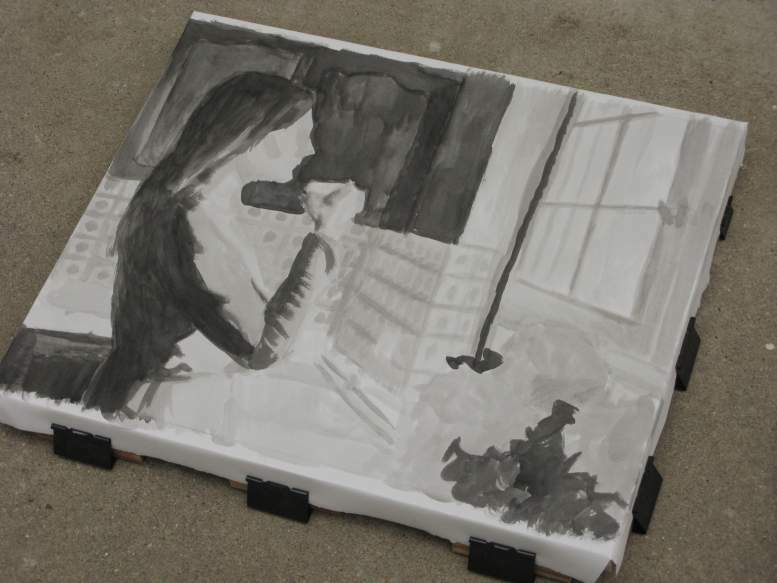 The painting will be in casein, but here I’ve roughly laid out the placement of things in black ink. I’m using Higgins Black Magic shellac ink, which only gets to a dark gray value unless you paint over it in multiple layers. As such, it works well for a beginning undertone. I’m not too concerned with getting precise values now, since it’s mostly about the placement of things. To test out how the coverage of casein paint over this ink will look, I painted over some scrap paper using various colors of cadmium red & yellow, cobalt blue, burnt umber, and titanium white. 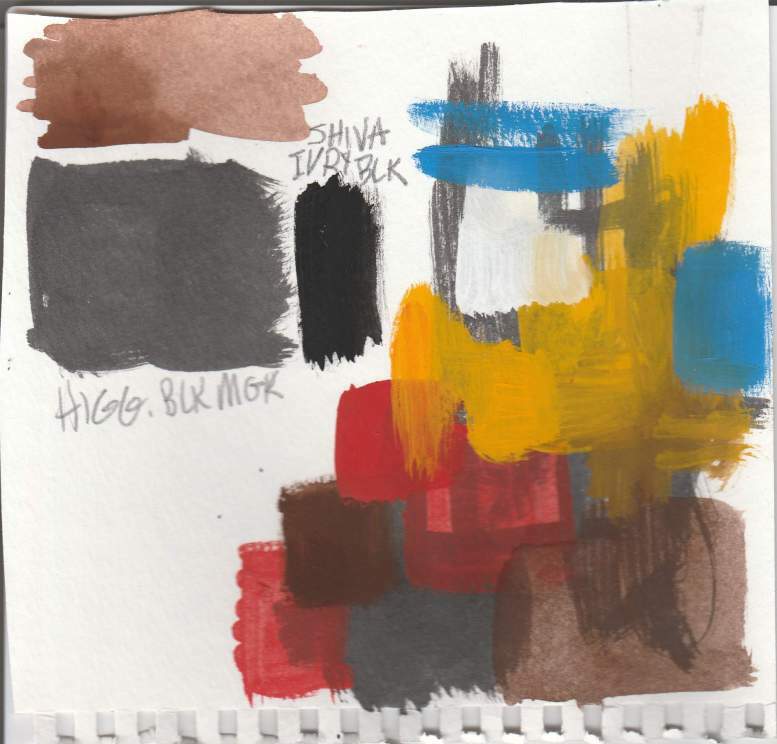 There’s a swatch of the undiluted Higgins ink on the left with some casein Ivory Black next to it to show the difference in value. The colors are still a bit transparent, even when undiluted, but I don’t mind if some of the ink undertone shows through. It will show more of the whole process in the final result, plus I can add an extra layer or two of paint to cover that up if necessary. You are currently browsing the Artwork by D. B. Clemons blog archives for January, 2018.